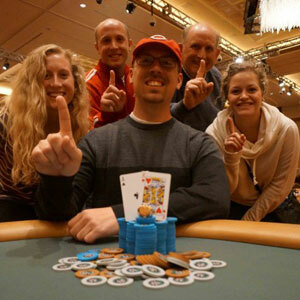 Brad Albrinck Wins the WSOP Circuit Main Event. The tournament was the first ever WSOP Circuit event held in the state. The WSOP Circuit is spreading faster than a cold in an airplane. Each and every year, it seems like new locations are being added and that more players are buying in for their chance to win a coveted gold ring. This year’s WSOP Circuit at the Horseshoe Casino in Cincinnatti, Ohio proved to be no exception. The first WSOP Circuit Main Event ever held in the Buckeye State, it drew 740 players and generated a staggering $1.1 million prize pool. And when the smoke cleared it was local amateur Brad Albrinck who would be declared the winner. On paper, Brad seems like a pretty normal guy. He holds a Master’s Degree from the University of Cincinnati and currently earns an honest wage working as a solid waste engineer. During his free time, he enjoys playing poker. But don’t let his amateur status fool you. Brad is an accomplished player who boasts dozens of tournament cashes, including multiple Heartland Poker Tour final tables. Before his victory at the Horseshoe, Brad had already accumulated several hundred thousand dollars in career tournament earnings, more than $134k of that in WSOP events alone. It is conceivable that the part-time poker player only played in the Main Event because it was so close to his home. The nearby location also allowed some of his closest friends and family members to rail him during his heads-up battle with David Kash. Luckily for Albrinck, the heads-up affair would not last long. After just a few hands, the two got it all-in. Albrinck held A-K and Kash A-T – a cooler of sorts. Albrinck would dodge a three-outer and be pronounced the victor. He received a hefty $221,994 for his efforts. Also featured at the final table was 2011 WSOP bracelet winner Aaron Steury, and gold ring winners Keven McColgan and Josh Williams. Albrinck himself was no stranger to a circuit final table, as he finished sixth in the Hammond Main Event last year. Suffice to say, navigating the final table would prove a difficult affair, for anyone. When asked about the win, Albrinck replied It’s several years of my salary, putting into perspective just how life-changing winning a major poker tournament can be. For his efforts, Albrinck also earned an automatic entry into the WSOP Circuit National Championship, which will take place in Atlantic City next May. The $1,675 buy-in reentry event paid the top three runners over $100k each, and everyone in the top eight received at least $26.4 for their efforts.